When Apple reported iPhone sales were down last quarter, some watchers and analysts thought folks were just holding off ahead of the iPhone 5, which is expected to ship on September 21. However, more than a few observers thought something was amiss with low iPhone numbers and, as it turns out, they just might have been right. Rumors of the upcoming iPhone 5 have been legion for months and, now, we have confirmation that it will be introduced on September 12 and then ship September 21. With all of this buzz, it is believed many potential buyers have been delaying the purchase of a new iPhone in anticipation of Apple’s latest, greatest smartphone. Or, that’s the theory. Another take on why Apple sold so few smartphones is that AT&T and Verizon have been pushing retail customers to buy anything but an iPhone. 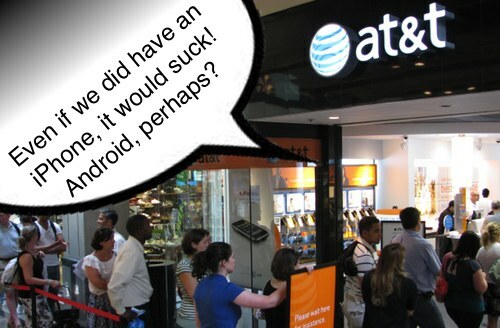 Regional retail sales managers at AT&T have been instructing store managers to pump the brakes on Apple’s iPhone. Instructions handed down from corporate state that customers seeking smartphones at AT&T retail stores should be steered away from Apple’s (AAPL) iPhone and towards Android phones or Windows Phone handsets like the Nokia Lumia 900 instead. For what it’s worth, AT&T has denied the charge, but anyone who’s visited one of Ma Bell’s stores in search of an iPhone will tell you different. It’s well known that both Verizon and AT&T retail offer sales reps cash incentives to push Android and Windows Phone devices. Apparently, those weren’t enough and now the companies, which are rumored to be dissatisfied with the subsidies they must pay Apple for each iPhone, have made it corporate policy to drive down Apple smartphone sales in response.